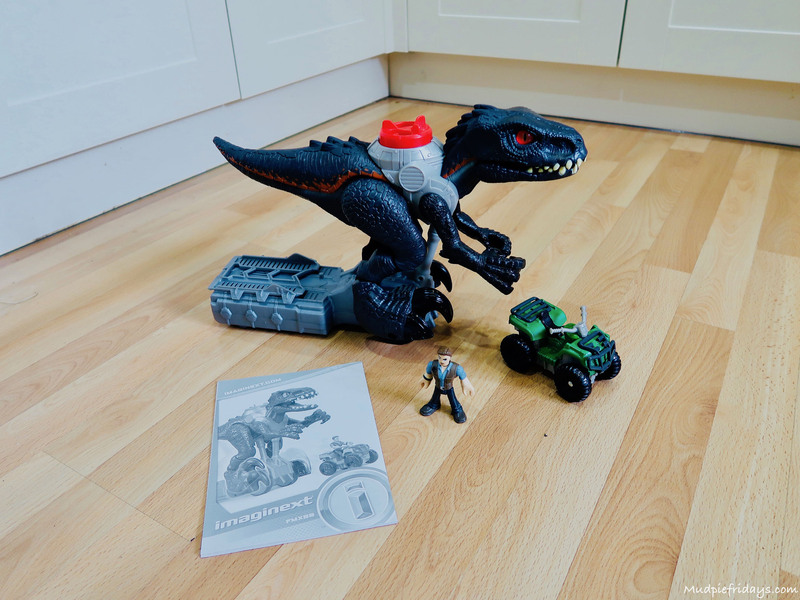 You will know that Monkey is a little Dinosaur mad so when we were approached to see if we would like to review the Fisher-Price Imaginext Jurassic World Range I of course said yes! Fisher price Imaginext as a brand that is new to us having not tried anything out in the range before. What attracts me to it though is the fact that all the pieces in a range mix and match. 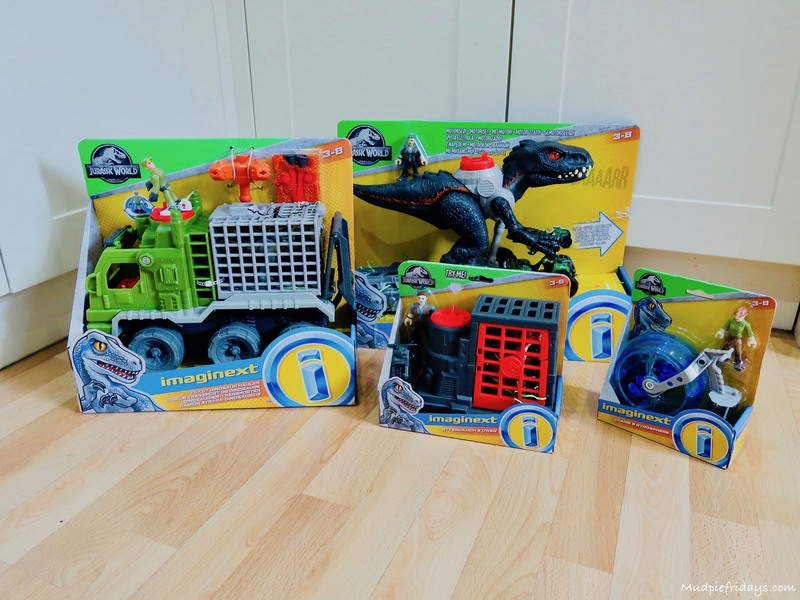 They are all designed to be played with together, for example the people include in the Jurassic World range fit with all the vehicles. Which is brilliant because it means Monkey’s play is not limited in anyway. 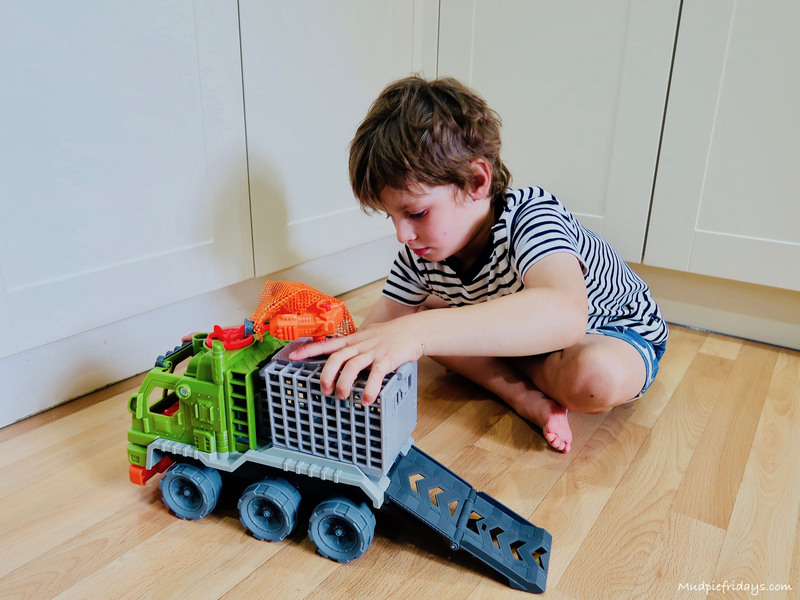 He won’t get frustrated because certain figures won’t do what he wants them to for his imaginative play. We were sent four different toys in the range. 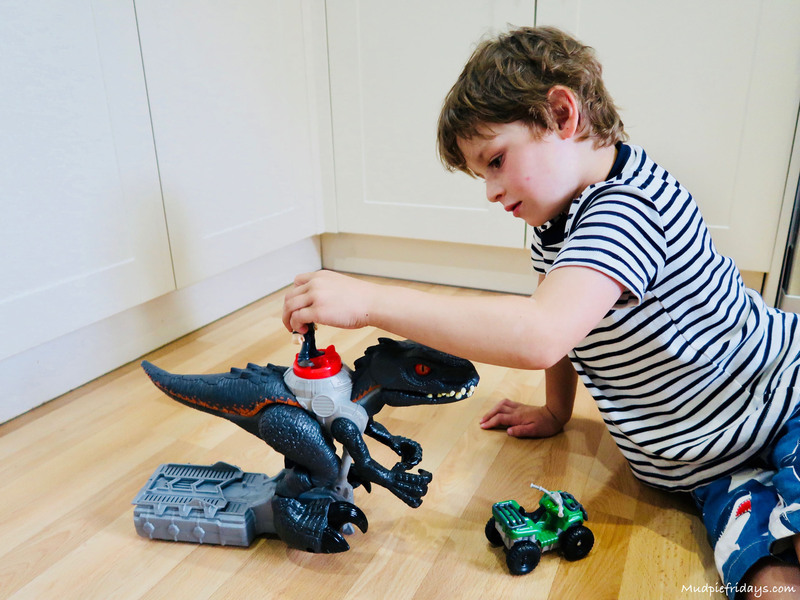 A Basic Character RRP £11.99, a Feature Character RRP £18.99, Dinosaur Hauler RRP £42.99 and a Walking Indoraptor RRP £64.99. The ranges promises the ability to act out many prehistoric adventures so how did we get on? Monkey started with the Basic Character which we received Claire & Gyrosphere. The basic characters are designed to come with a character figure and a vehicle. Monkey enjoyed rolling her across the floor searching for dinosaurs. Its clever as she remains upright in the seat regardless of how fast Monkey pushed her. We then moved onto the Feature Character, which includes a super cool dinosaur, character figure and accessory. There are three to collect, we received Stygimoloch & Owen. Owen is trying to put the stubborn Stygimoloch back into the right enclosure. Owen comes complete with motorcycle so that he can chase the dinosaur around. 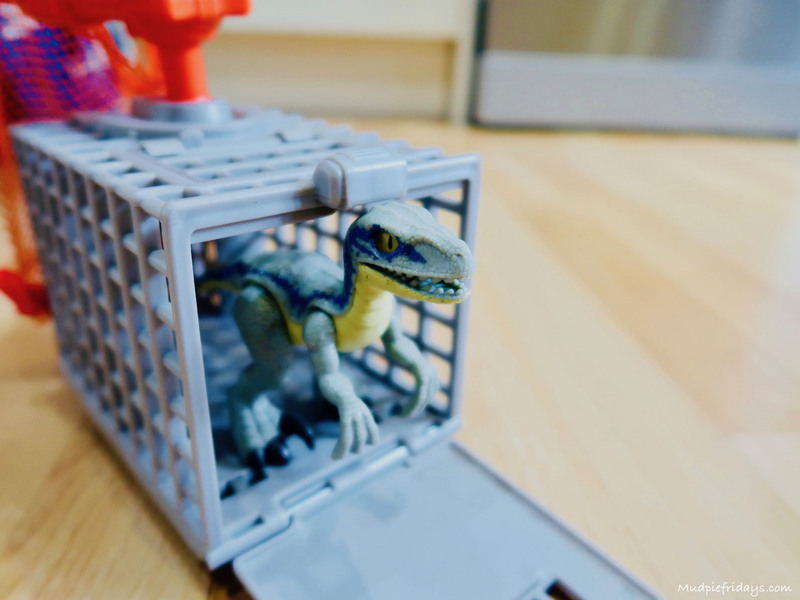 Placing Owen on top of the podium and pushing down opens one side of the enclosure for the dinosaur to escape. Owen fits on the bike really easily and is easy for small hands to manipulate. Monkey’s favourite by far is the Dinosaur Hauler. I think this is because of all the moving parts. 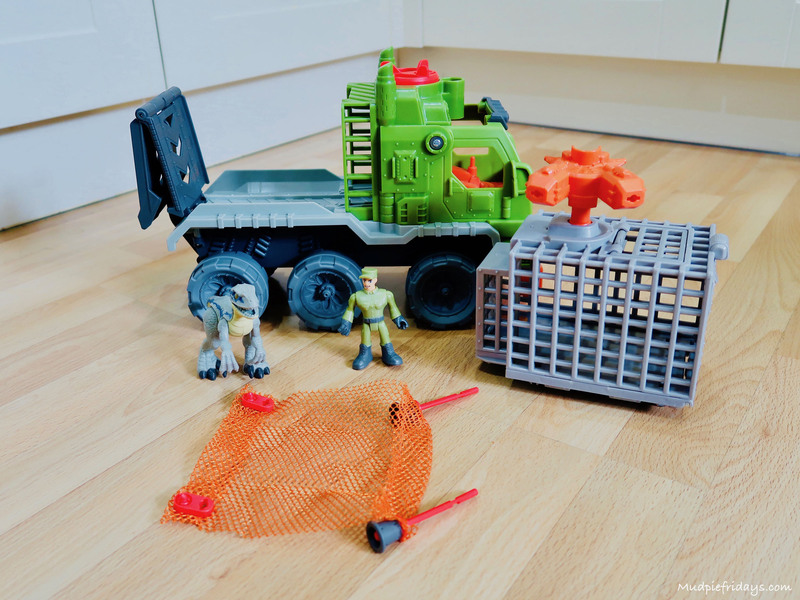 In the box you get the hauler vehicle, projectile launcher, net projectile, dinosaur and Asset Containment Unit (ACU) figure. 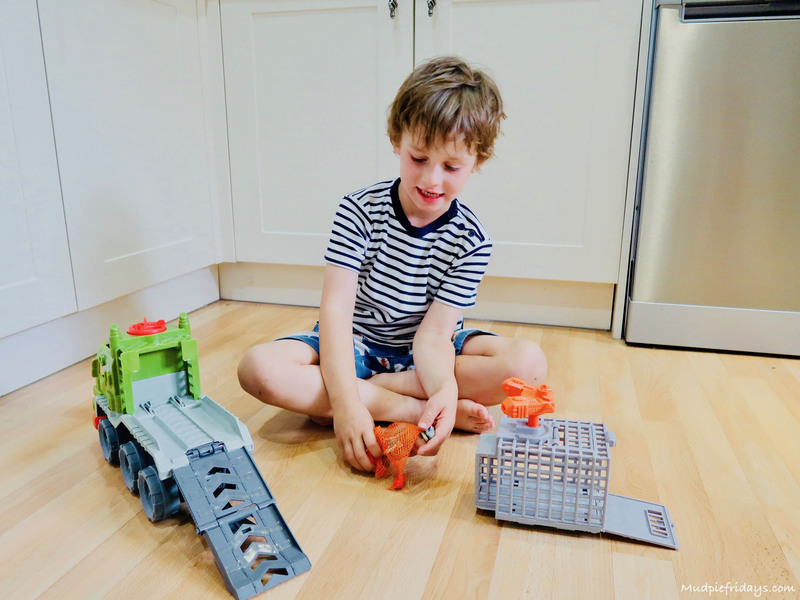 There are no batteries required which means the fun can begin straight away. It didn’t take Monkey long to figure out how to attach the net and how to make if fly. Which is done by pressing a small red button on the top of the firer. On top of the hauler there is a power pad. When the character is placed on top and it is pushed down and turned the ramp is lowered. When turned completely the cage is ejected fully. Monkey had great fun trying to catch the dinosaur, he got very good at managing to get the net to land over the dino ready for it to be hauled back into the cage. It was lovely sitting and listening to him talk through the stories he was acting out. Listening to his imagination. Especially when he has not seen any of the films. We then moved finally onto the Walking Indoraptor which he was really excited about. 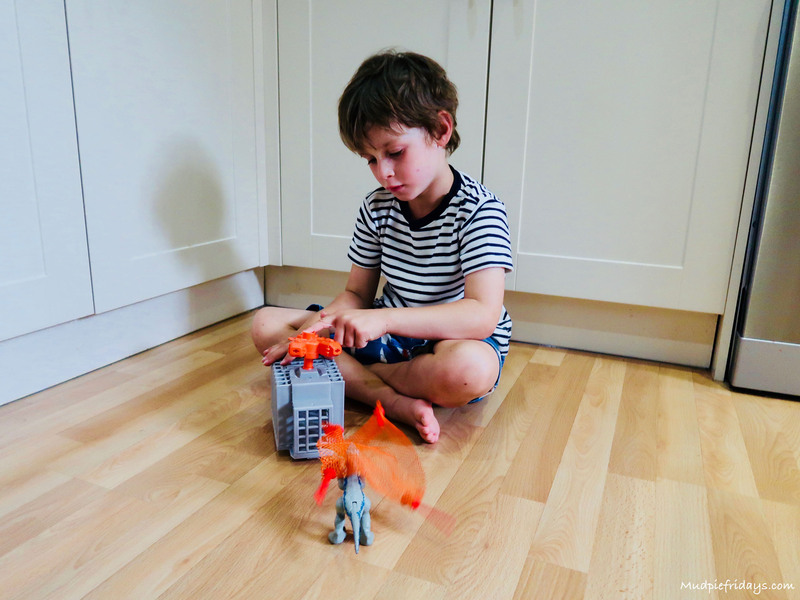 Although I am a fan of toys that don’t have batteries you can not argue with the excitement a moving roaring dinosaur creates. He knew exactly what to do with it too, after seeing it on TV! 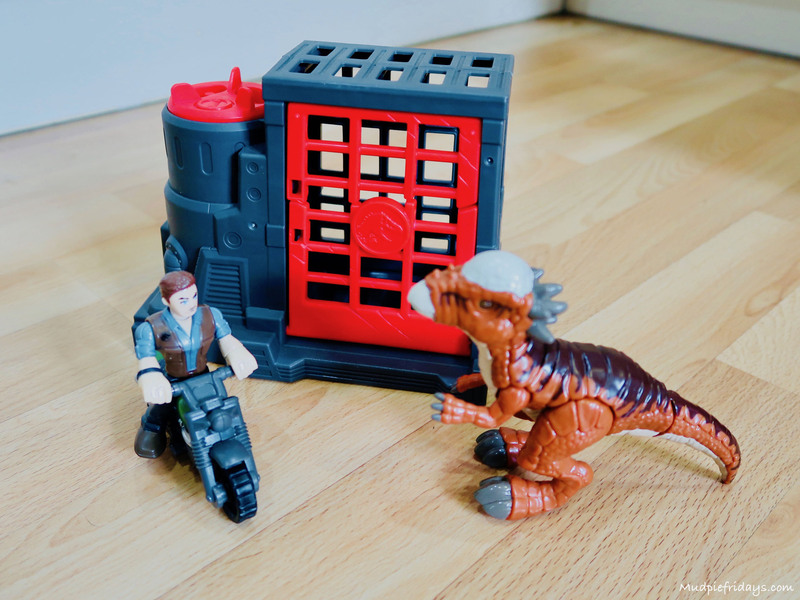 In this box you get the Walking Indoraptor, ATV and an Owen figure. There are two ways to make the Dinosaur walk, either by driving the ATV in front of it to start the chase mode. Or by placing Owen on the power pad and pushing down which will then mean the dinosaur will move in straight line. It does required 6 x AA batteries and 2 x AAA batteries which are included. There are two stomping speeds walking or rushing. By pushing another power pad you can get the dinosaur’s mouth to open. Money really enjoys playing with it. He’s not had anything like this before and is really excited by the fact that it moves and chases. He really enjoys playing with the range and I can see us getting a lot of use out of it in the coming weeks and months. The detail is great and the quality is what I would expect from Fisher Price. For dino mad kids they would make wonderful gifts and I don’t have any concerns recommending them to others. 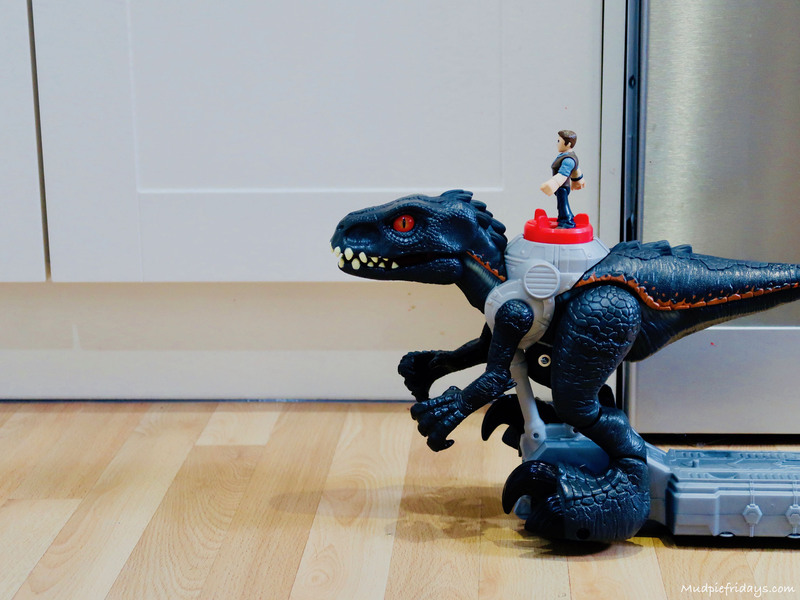 In fact if you like the look fo the Walking Indoraptor you will be pleased to know that the lovely people at Fisher Price have given me another to giveaway worth £64.99. To enter please use the gleam application below and please note the T&Cs. We were sent these toys in return for an honest review, all words and opinions are my own. My grandson would be thrilled ! My son would be thrilled if I won this ! This would be a great present for my nephew, he’s dinosaur mad! It’s great that so many children are into dinosaurs these days. 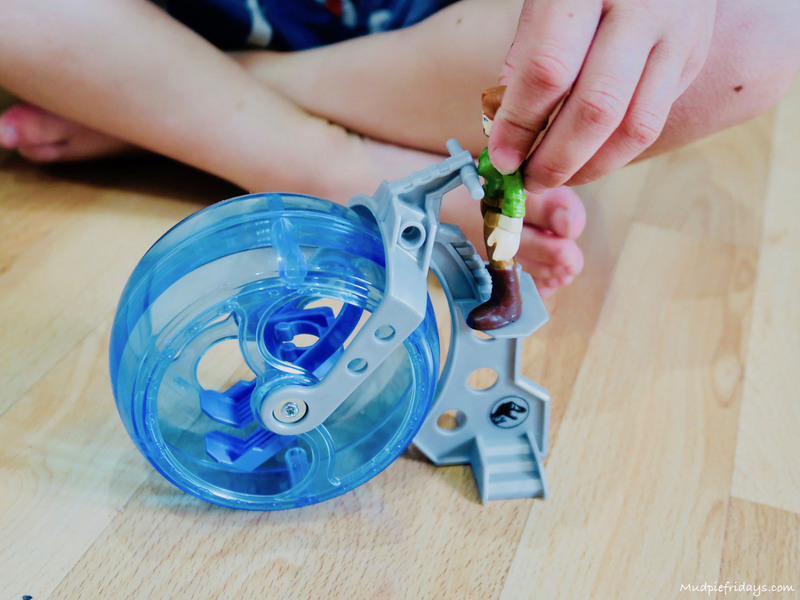 I can think of a couple of kids who`d love to play with this – thanks! My eldest son would love this. This looks amazing! 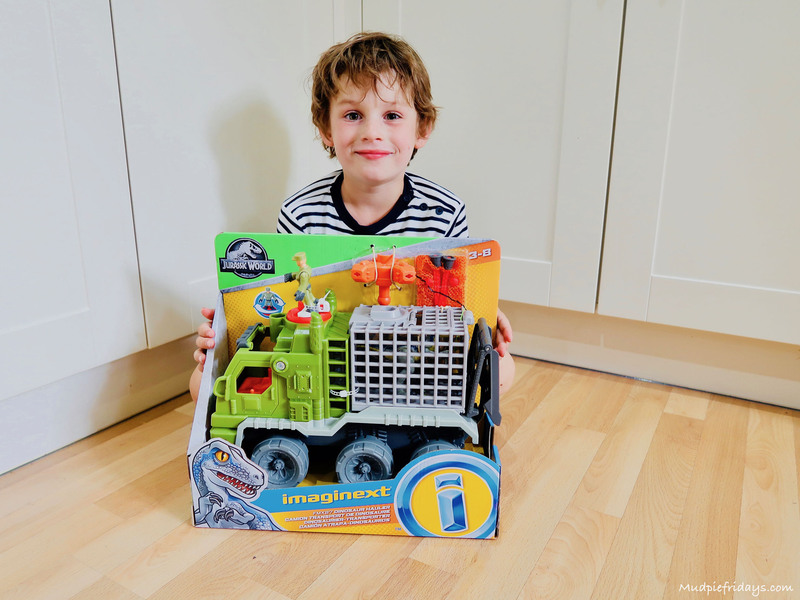 Imaginext toys are so well made and my son is the biggest Jurrasic World fan, so I would love to win it for him. I think all kids are interested in dinosaurs so these toys will be a hit. Our son would love this, thank you! My son is dinosaur mad! Is it ok to say that I want one of these? What fun! The children would love it, of course! My 7 year old son Lloyd would be over the moon if he won this. 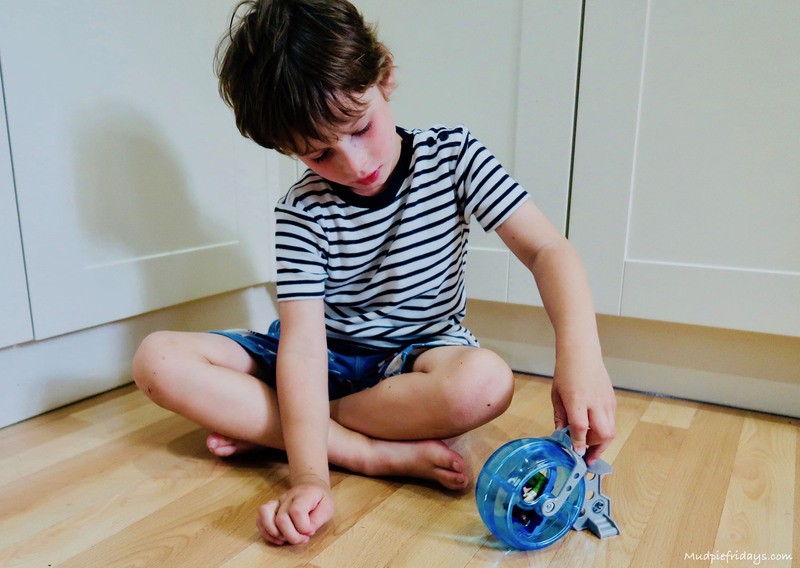 These look amazing – does it matter if I play with it more than the kids?!! My nephew is obsessed with dinosaurs, he would love this prize. Fingers crossed. 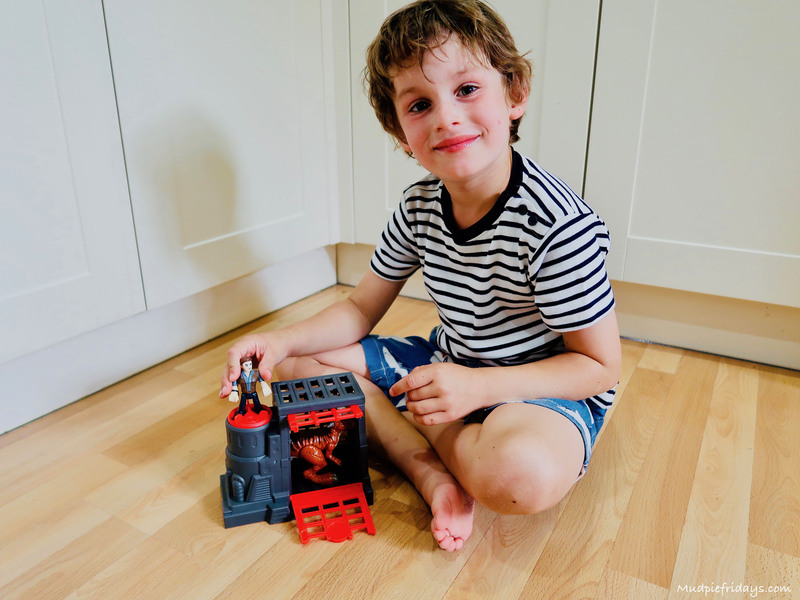 A great playset to keep them busy, we are big imaginext fans! My nephew would love this!! So cool! Great giveaway! My nephew would love these! My sons are dinosaur mad and would love this! My dinosaur mad son would be over the moon! Would go down very well with my niece! My son still loves imagined and he’s 7! Fisher-Price toys are always fantastic quality. This looks fierce! this is so awesome!! the amount of fun you could have with this!! 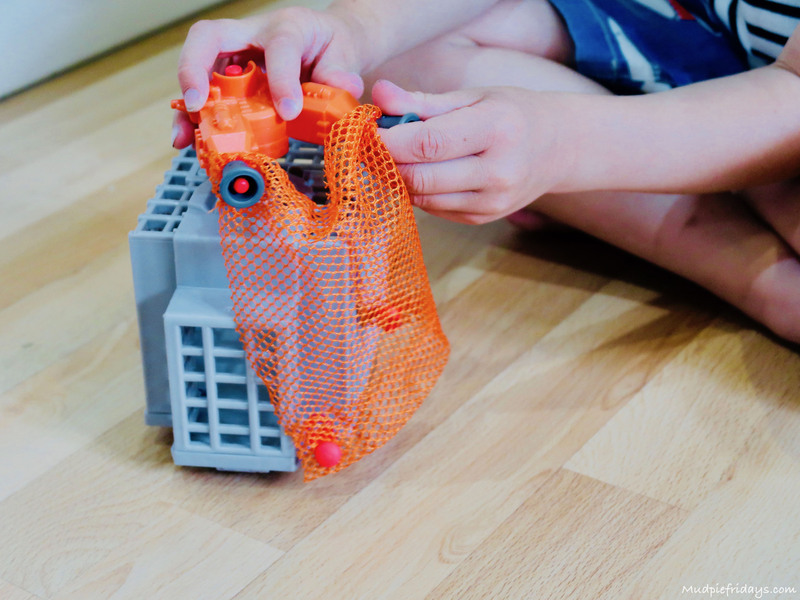 This looks so much fun – ideal for my nephew. My son would be thrilled if he was lucky enough to win. He adores anything to do with Jurassic World. I love Fisher Price toys. They are always good quality. My granddaughter loves dinosaurs and would love this. This collection looks great fun and good quality. The dinosaur looks like it has a lot of playability and my daughter would think it was great fun. My grandson is Dinosaur mad so he will love this! My little boy would absolutely love these, he’s in love with dinosaurs! What a ROARRRRRRRSOME bundle! wow my Twins would be dellighted! They never had anything this cool when I was a kid. My 3 year old son would love this, he loves the Imaginext toys. I love imaginex toys, so well made. These would be great for our grand children they adore Dinosaurs mind you l have always loved dinosaurs so i’m probably a little to blame!. This would be absolutely wonderful for my godson as he is absolutely obsessed with dinosaurs and his birthday is coming up at the end of September! My little nephew would absolutely adore this! My son would absolutely adore these!